This week’s challenge is lunchtime. 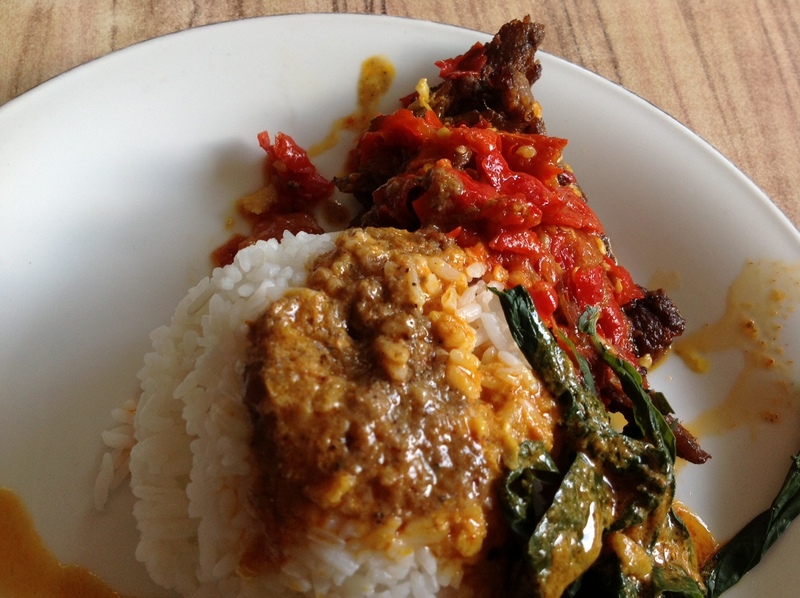 I ate Nasi (Rice) Padang with Dendeng Balado (Padang food with beef with red chilly). Padang food is the cuisine of the Minangkabau people of West Sumatra, Indonesia. It is among the most popular food in Maritime Southeast Asia. It is known across Indonesia as Masakan Padang (Padang cuisine, in English usually the simpler Padang food) after the city of Padang the capital city of West Sumatra province. It is served in restaurants opened by Minangkabau people in Indonesian cities. Padang food is ubiquitous in Indonesian cities and is popular in neighboring Malaysia and Singapore. The term “Padang food” is often used to designate the whole culinary traditions of Minangkabau people. However, this term is seldom used in Minangkabau inland cities such as Bukittinggi — a culinary hotspot in West Sumatra where they refer to it as Masakan Minang or Minangkabau food, since there are differences between Nasi Padang of Padang and Nasi Kapau of Bukittinggi. Padang food is famous for its rich taste of succulent coconut milk and spicy chili. Among various cooking traditions within Indonesian cuisine, Minangkabau cuisine and most of Sumatran cuisine, demonstrate Indian and Middle Eastern influences, which is various dishes cooked in curry sauce with coconut milk, also the heavy use of spices mixture. Once you try, you will love it! Ping-balik: Weekly Photo Challenge: Lunchtime (3) Yemen | What's (in) the picture? Selanjutnya Pos berikutnya: Ball Strike – An Augmented Reality Game for Exercising!